When you’re trying to build brand loyalty, it’s best to snag consumers when they’re still kids. 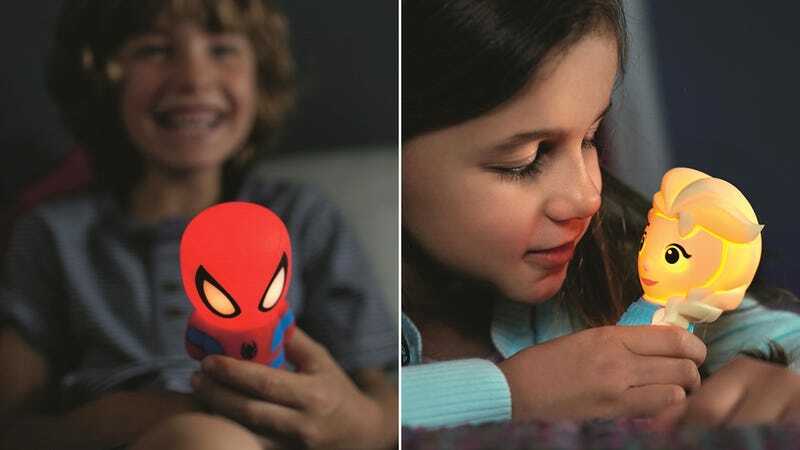 So Philips is teaming up with Disney to expand its lighting line with a series of glowing characters called SoftPals that kids can use as night lights right in bed with them. Made from silicone so they’re soft, squeezable, and safe, the aptly-named SoftPals are battery powered so they don’t need to be tethered to an outlet. And with LEDs on the inside they won’t get hot to the touch if left glowing for hours. Built with a simple tilt-activated timer, they can also be set to automatically turn off after five minutes to help a child fall asleep. When available in a couple of weeks for around $25 each, the SoftPals will feature characters from Frozen, Monsters Inc., and Spider-Man. But given the tremendous number of properties Disney now has at its disposal, you can expect to see more characters available down the line, including Star Wars given a new movie is enroute.